This entry was posted in garden history, Historic garden restoration on 30th December 2009 by Tom Turner. Dorothy Frances Gurney wrote that “One is nearer God’s heart in a garden/Than anywhere else on earth.” Her father and husband were Anglican priests – so some might read this as her criticism of male egotism! Or one might think that the Miserere sung in Europe’s most perfect building (I would give this award to King’s College Chapel) takes you closer to ‘God’s heart’. The Vatican kept the music private for centuries. Mozart went there, memorized the score, went home and wrote it down. Christianiaty has a chequered relationship with art and gardens. Gardens are celebrated in the Song of Solomon and the Garden of Eden story (see blog post) but the Christians felled sacred trees throughout Europe and have never given gardens the support they have had in Buddhism and Islam. Last time I saw the garden of Lambeth Palace (London home of the head of the Church of England) it was an utter disgrace – and most Church of England cloister garths are badly or inappropriately managed. Anglican Christianity is losing support for a host of reasons but Christian music is entirely holding its own – always making the case for a simple, idealistic and joyful approach to the world. The drive for perfect simplicity + imaginative creativity, as seen in Kings College Chapel, may be connected to Bill Gates’ obsevation that he liked Cambridge because it had won more Nobel prizes than the rest of Europe put together. My own view, as a ninth generation skeptic, is that while there is something utterly wonderful about Christianity, it is in urgent need of renewal ( perhaps a ‘New New’ Testment). So I wonder what garden designers can contribute to the architecture of a new landscape. We have had apologies for the Crusades and the Inquisition. Please can we now have a full and frank apology for the felling of Sacred Trees – and then a quest to produce a contextual design as perfect as the singing of the Miserere in King’s College Chapel. This is my Christmas and New Year wish for 2010, made on the day after the pagan New Year (21 December) and therefore a day of hope for the return of warmth, sunshine and flowers. London is having a cold, wet and slushy end to a year of economic turmoil. PPS If the two pieces of music are run similtaneously the result is curious East-West mashup. This entry was posted in context-sensitive design, Garden Design, garden history on 22nd December 2009 by Tom Turner. This entry was posted in Cycle planning, Historic garden restoration, Sustainable design on 19th December 2009 by Tom Turner. Scotland's Old Red Sandstone was laid down in hot, dry, arid conditions - about 400 million years ago. Homo sapiens evolved about 4 million years ago and is not responsible for the climate change from hot arid desert to cold wet coast. What percentage of global warming is caused by burning fossil fuels and felling rain forests? What percentage difference would result from the measures advocated by reasonable scientists? This entry was posted in carbon cycle balance, Garden Design, Urban Design on 16th December 2009 by Tom Turner. RMIT University in Australia publish the annual publication Kerb and Vol 17 asks the question ‘Is landscape architecture dead?’. It is a good question and a handsome volume with interesting illustrations. But most of the articles in Kerb led me to think that ‘if this is the future of landscape architecture, then it deserves to die’. The images do not have either captions or any discernable relationship with the text. Most of the 26 articles are inconsequential: significant questions are asked; random assertions are made; obscure paragraphs abound eg1 ‘Contemporary landscape architecture has not produced an aesthetic paradigm that describes the vicissitudes surrounding the idea of nature today’ (p 10), eg2 ‘landscape is not an object. yet this image of landscape is projected upon the world with each project you undertake’ (p.73) eg3 ‘interpret ‘scape as meaning ‘pretty dress up’. Dig up a Chinese creek bed, polish the booty, and dress up my ‘scape outside the screen door’ (p.92). But I must be wrong: many young Australian landscape architects come to work in London and they have earned a good reputation for Australia’s landscape schools. This entry was posted in Book reviews, Garden Visiting, Landscape Architecture on 12th December 2009 by Tom Turner. Sometimes the most surprising green spaces are those that have been quietly there all along. 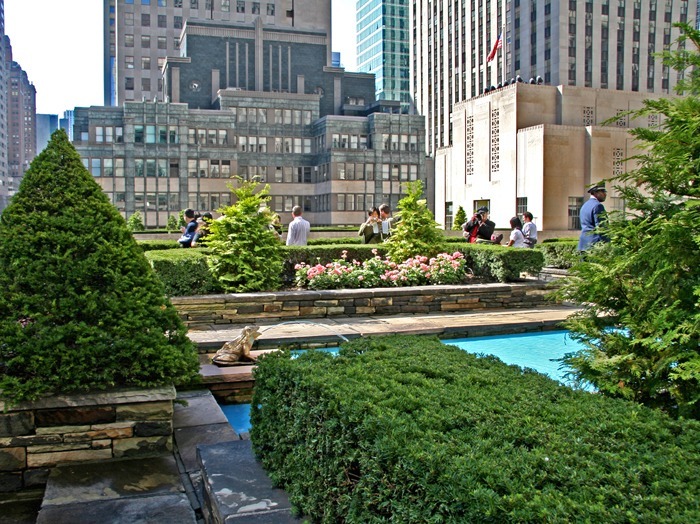 This is so of the roof top garden on the British Empire Building at the Rockerfeller Centre. It is an example of visual space, a pleasure garden brilliantly contextualised with the surrounding architecture. The heavily geometric topiary subtly reflects the enclosing skyline: quite a challenge when the skyline includes St Patrick’s Cathedral. Kensington Roof Garden formerly Tom and Derry’s in London is another example of a visual space, albeit this time as an enclosed garden. Of more particular note, is the roof garden at Villa Savoy by Le Corbusier, which it can be said is largely responsible for the idea of roof gardens in the modern era. The Kaiser Roof Garden by Henry Kaiser is another example of a modern visual landscape at risk. It is to be hoped that the heritage value of these modern gardens is recognised and that organisations like Landslide which are dedicated to their preservation are supported. The next generation of visual space designed as sustainable green roof gardens are still being imagined. Hints of what they might look like are out there….This roof by the Australian architects Hassal for the Adelaide Zoo demonstrates a sensitivity to context (in this case a bushland setting) which characterises visual space. The private residential roof garden by Charotte Rowe in Holland Park, although conservative in conception, demonstrates a heightened sense of visual awareness with consideration of light for night and daytime uses. It would be amazing to a roof garden taking inspiration from sources such as the waterlily garden at the Mauritius Botanic Gardens by John Duffy. This entry was posted in Garden Design on 9th December 2009 by Christine. The illustrations are excellent but the text is disappointing. Italian gardens suggests a book about the gardens of Italy but as the subtitle – a cultural history reveals it is not a book about garden design. Design is mentioned but it is not treated systematically. Chapter 2, on Medici gardeners 1518-1550 opens as follows ‘The desire to make gardens is like a hereditary disease’. While not objecting to wit, I do not see this as a useful explanation of how one of history’s greatest gardening families acquired its passion for gardens. Nor does Atlee give any account of Italy’s Roman gardens, as the title would lead one to expect. A newcomer to the subject might think the first gardens ever made in Italy date from the fourteenth century. Atlee is the author of several travel guides to Italian gardens and this book is more akin to a guide book than a history book. The cultural history of gardens is an interesting topic but I do not see why it should be detached from the design history of ‘how and why gardens took their present form’ (see comment on John Dixon Hunt’s use of the term cultural history). One could write cultural histories of furniture, or milk bottles, but they would not serve as substitutes for design history. So why separate the two approaches to history? My impression is that cultural historians have less appreciation of design than design historians have of culture. They tend to be ‘words people’ instead of ‘word and image’ people – and they don’t seem very good at reading plans. My recommendation to someone taking up garden history is to begin by measuring, drawing, photographing and writing about a single historic garden, including an account of the cultural context in which it was formed. From the other end of the telescope, I believe designers should have a broad appreciation of the cultural, technical and artistic context in which they are working. This entry was posted in Book reviews on 8th December 2009 by Tom Turner. The next generation of green roofs will be designed to ensure the survival of specific species providing much needed ecological space in the urban environment. BAM believe the next ecological objective in green roof design is the creation of biotropes – living habitats for species such as migratory birds. While not a roof habitat exactly, Neil Oxley came up with the idea of a man made tree for the city of Leeds to support bats, birds, butterflies, insects and even the much maligned urban fox. Kadas’ research into the potential for green roofs to support rare invertebrates suggests there is greater potential for green roofs to promote urban habitats. Restoration ecologist and resource planner Paul Kepart of Rana Creek believes in the near future green roofs will be graded according to a biodiversity index. In keeping with these concerns plant ecologist Christine Thuring emphasises the need for green roofs to form a series of linked habitats or archipelagos. It still seems some way off before we start to think of ways of providing green habitats – even roof space – for our larger land based fauna currently being displaced and endangered by urban activity. This entry was posted in Garden Design and tagged ecological space, Garden Design, green roofs, Urban Design on 7th December 2009 by Christine. Katherine T. von Stackelberg has written a book on The Roman Garden (Routledge 2009). At $100 for 182 pages, the list price seem high. Her work began ‘one spring morning when my mother asked what Roman gardens looked like’. The 16 b&w illustrations do not provide much of an answer. Seeing garden history as a ‘word and image’ subject, I regret that more effort was not put into picture research. 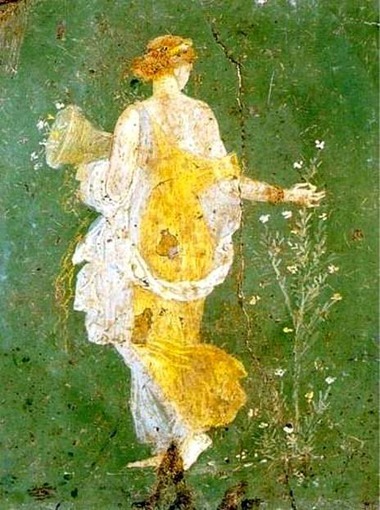 The beautiful painting of Flora, right, is discussed on page 1 but it is not reproduced as a plate and there is no reference to the book jacket – on which it appears as a dull sepia image. Chapter 1 has some useful information on Roman use of gardens. Chapter 2 opens with the remark that ‘all landscapes are, to a greater or lesser extent, cultural constructions’. Does she mean that the world had no landscapes before Homo sapiens evolved? I don’t think so. The chapter is an unenlightening application of cognitive theory and Bill Hillier’s space syntax theory to gardens. Nor are Foucault and Lefebvre are easy companions for a garden walk. Chapter 3 is about Experiencing the Roman Garden but should perhaps be called ‘How a cultural theorist would experience a Roman garden’. It says little about sights, scents or sounds. I fear the author’s mother will know little more about ‘Roman gardens looked like’ if and when she reaches the end of her daughter’s book – in fact I would recommend her to begin with the three Case Studies in Chapter 4. I can however recommend this book to people who are interested in the polsemic potential of gardens as a vehicle of communication (p.141). This entry was posted in Garden Design, Urban Design on 4th December 2009 by Tom Turner. Written by Mike Jones and published in 2005, this is a beautifully produced book on the Royal Pavilion in Brighton. Jones was head of Conservation and Design in Brighton and has contributed a remarkable set of flower paintings to the book. 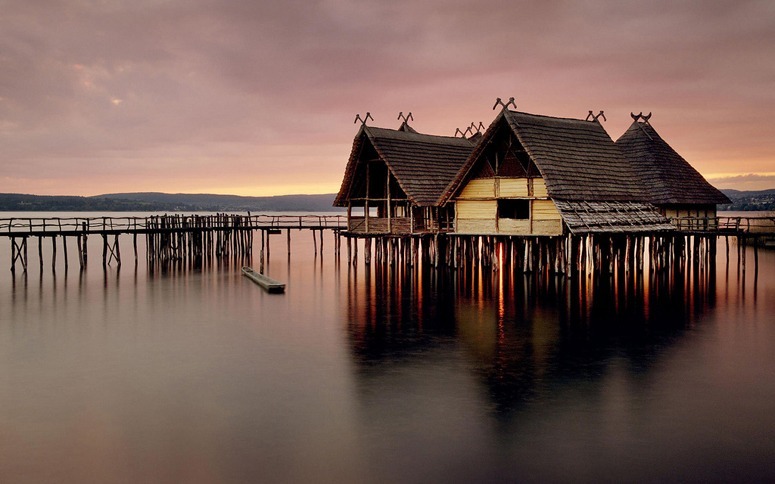 It gives a full account of the original project and of the restoration project. One could hardly ask for more but, for me, the project raises a question: was the decision to restore the Nash garden design right? John Nash designed the garden but his ‘inspiration’ undoubtedly came from his former partner, Humphry Repton. Repton published a full account of his own garden design ideas and they were much better than Nash’s scheme. So isn’t there a case for implementing Humphry Repton’s design? This entry was posted in Book reviews, Historic garden restoration on 4th December 2009 by Tom Turner. The book on Italian Garden indicates what is meant by the term ‘cultural history’ . It is the work of ‘a distinguished group of Italian, American, English and German scholars, with different backgrounds in art history, literature, architecture, planning and cultural history’. I appreciate the study of every aspect of gardens but am most interested in the questions of how and why they were designed, which appears not to be a significant aspect of ‘cultural history’. 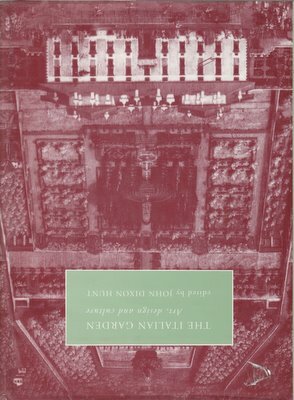 The 1996 Italian Garden Chapter of most interest to me is D R Edward Wright’s ‘Some Medici gardens of the Florentine Renaissance: an essay in post-aesthetic interpretation’. He concentrates on the social use of gardens, a topic of much concern to designers but often neglected by garden historians. Wright comments that it is ‘as if human use of planned environments was a mere afterthought to an essentially artistic endeavour’. He distinguishes between the high society uses of the Boboli Garden, the relatively pastoral use of the Villa Castello – as a health resort, and the use of Pratolino as a hunting park. I hope the projected Cultural History of Gardens has more chapters like this and fewer literary canapes than Italian Garden. This entry was posted in Book reviews, garden history on 4th December 2009 by Tom Turner. The greentainer project by Exposure architects demonstrates the innovative social potential of relatively simple green roof spaces. 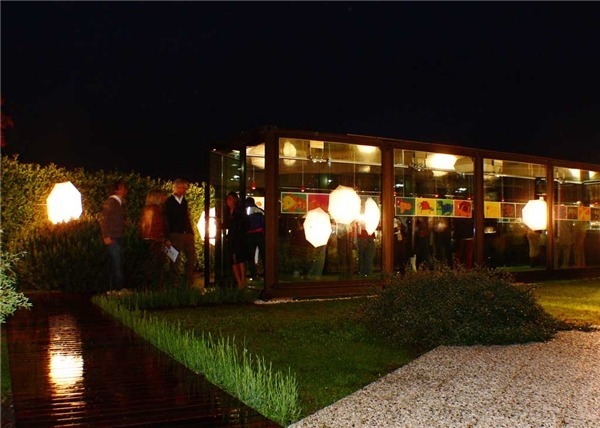 By importing a modern green house to function as a flexible space for art exhibitions, soirees etc the social use of a roof garden space can be enhanced without detracting from the vibrancy of its outdoor quality. The Residences 900 in Chicago is a beatifully executed (but more conventional) social space on a green roof. However, the benefits of a mixed garden to ecology cannot be underestimated. The roof garden on the 17th floor of the Washington Mutual Bank is a little more zen. It creates a contemplative social environment reminiscent of a wind swept plain – yet provides views across Elliot Bay. This entry was posted in Garden Design and tagged Garden Design, green roof, social space, Urban Design on 4th December 2009 by Christine.